The clean, quiet and environmentally harmonious United C.A.T Series range is designed to provide hygienic, environmentally sustainable and safer solutions for all lifting and usage requirements in the warehouse, says Craig Coles, CAT Lift Trucks Product Manager, United Forklift and Access Solutions. The electric range – which includes C-Series pallet trucks to replace manual hand pallets, A-Series Walker Stackers and T-Series Walker Reach Stackers – is offered at price points that make their efficiencies and OH&S benefits accessible for all businesses, including especially small businesses, while offering quality and reliability without compromise. “This new range is designed to meet the warehouse lifting needs of a wide range of businesses, while also opening up access to improved operational efficiencies and safety for companies that previously did not have access to such technology,” Coles explains. “Further, the range offers a broad range of options to enable individual businesses to further customise trucks to meet their individual specific needs. The new United brand range is based on globally proven designs that deliver reliable performance and precision operation with maximum uptime in industries such as manufacturing, materials handling, food and beverage, retail and warehousing. 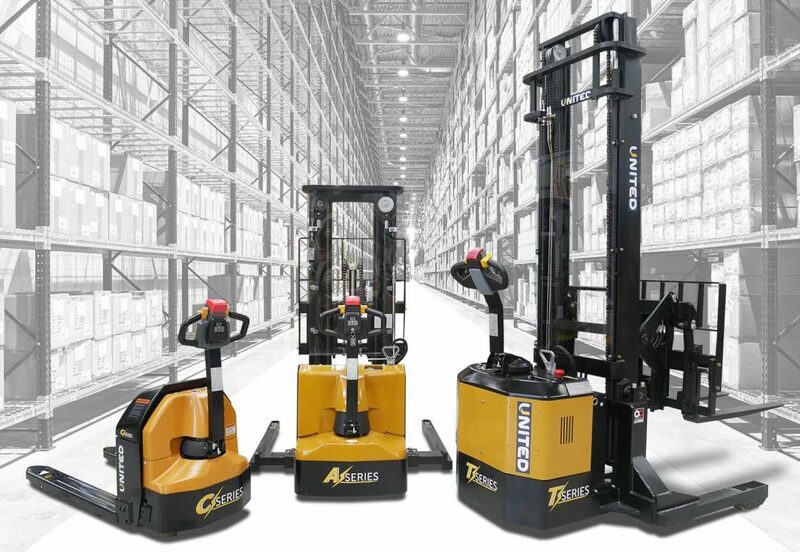 The electric forklift range – incorporating a high level of safety and operational features as standard – is also backed throughout Australia by United’s sales and service backup to the same high standards for which United is known, as a distributor for other top world-class brands. “This new range fills a place in the market for high-value, high efficiency forklifts that are ideally suited for the light-to-medium usage of small-to-medium businesses,” Coles claims. “Importantly, they can also perform a wide variety of heavy-duty tasks typically performed by forklifts solely dedicated to that purpose, but do not have the additional capital, rental or maintenance commitments involved. “The new electric forklift range provides excellent value for money, without compromising on quality, reliability or safety. United’s new electric forklift range has been designed for ease-of-use, ergonomics and optimised levels of safety. multifunctional handles, with further options such as proportional valves for even more precise control available on some models. intuitive display panels that display running hours, battery levels and error codes for quick troubleshooting. Individual models also feature innovations that suit them to the tasks for which they are designed, including a lithium-ion battery pack in the NPP12E pallet truck which facilitates greater performance and quick battery exchange to keep working. Features built into other members of the NPP family include innovations recognised in international product design Red Dot Awards. A-Series Walker-stackers (1.2 and 1.8 tonne capacity) include optional DC and AC motors to achieve optimal cost-efficiency in low use and heavy use applications. Series NSX models – which include maintenance-free AC motors – are perfect for loading and unloading from trucks and utes. They can handle all types of stacking and loading of pallets and can be optioned to sit the needs of particular types of business and tasks. “Consideration has gone into every element of the design of the range,” Coles adds.